Dehydrators use low temperatures and a fan to dry food, removing the water content but without destroying the food’s enzymes. This cheap to run, four-tray machine will dehydrate fruits and veggies ready for turning into chewy harvest bars and veggie crackers, and make batches of kale crisps, fruit ‘leathers’ (roll-ups) and other tasty dehydrated snacks. Herbs are an important player in a raw food diet, adding flavour and medicinal properties to dishes. The AeroGarden Sprout LED enables you to grow fresh herbs, salad greens and flowers year-round under its full-spectrum LED Grow Lights. It also comes with a Gourmet Herb Seed Pod Kit containing Genovese Basil, Curly Parsley and Dill. Let’s hear it for courgetti! Or how about carrot ribbons? 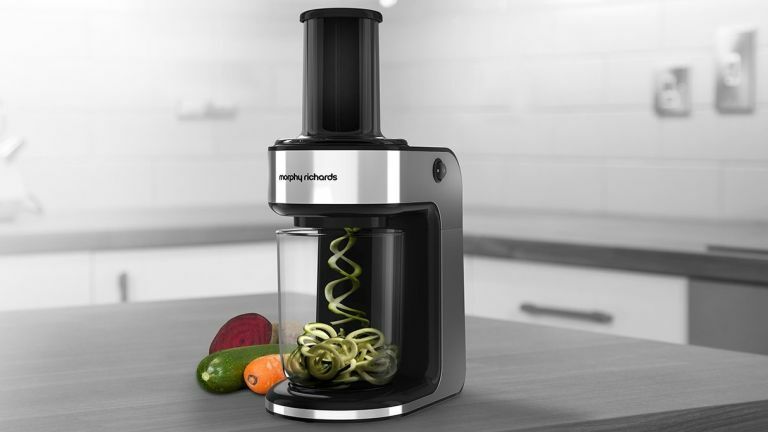 Yes, it’s all too easy to get carried away when you have a spiralizer and a shed-ton of vegetables to hand. The Spiralizer Express has two interchangeable heads for creating different sized spirals, from fine spaghetti to fat ribbons. Simply feed vegetables into the chute and watch ’em get spiralized. If you’re a fan of raw smoothies, the NutriBullet is a solid choice – it’s easy to use and produces a decent, nutrient-rich yield. For leafy, veg-heavy green smoothies we love the NutriBullet Pro 900, a 900-watt blender with twin extractor blades, a 32oz cup and a raft of accessories, including a recipe book. A raw food diet involves lots of slicing, grating, dicing, shredding, mixing and pressing, so a high-quality food processor is a wise investment. The KitchenAid Artisan Food Processor is a dream choice for many. This retro-style machine has a range of useful prep features, including ExactSlice for accurately slicing raw foods, and three sharp blades for handling tough-skinned foods. Think raw food drinks end with juices and smoothies? Think again. Kombucha is a live probiotic drink, made by fermenting sugar and tea with kombucha cultures, to aid with detoxification, digestion and energy. This five litre fermenting jar is a great starter vessel for brewing your own kombucha, designed with its own filter and valve tap. Want a serious upgrade? Try the recently released PicoBrew Model C.
Keep track of how many calories and nutrients you’re getting each meal by weighing ingredients on Terraillon’s innovative smart kitchen scales. More than 1,400 foods are included in the NutriTab database, with information displayed including the five main Recommended Daily Intakes: protein, carbs, fats, fibre and sodium levels. Sorted. Regardless of whether you’re investing in a food processor, you’ll still need a high-quality, all-purpose knife for prepping raw foods such as fruits, vegetables and nuts. The signature grooves on the side of this Santoku Knife help it slice effortlessly through raw ingredients, with food falling cleanly off the blade. Ok so it’s not the most exciting gadget you’ll buy, but this food saver will preserve all those delicious raw snacks you’re bulk-making. It comes with two rolls of vacuum packing and has a one-push button for sealing fresh food, ready for storage in the cupboard or fridge as appropriate. A luxury item, sure, but one that will deliver smooth, tasty juices, this stunning, 80RPM cold press juicer is designed to get the maximum nutritional content from fruits and veggies. The Omega 8006 breezes through wheatgrass and leafy greens, plus tougher veg like carrots, using a three-stage auger pressing action. Ready, set, juice!